Western Digital is not a name typically associated with networking and routers. If you look at their product line over the last few years it makes sense though. The Western Digital MY NET routers should make a fine accompaniment to their Powerline AV Storage, and WD TV Live. 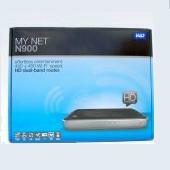 Today we are taking a look at the Western Digital MY NET 900. This Router promises to make Entertainment “Effortless” with advanced features and Easy Setup. It is common for manufacturers to boast this combination but few can perform the delicate dance to entice power users and the average consumers who want similar functionality but are used to getting it in a completely different fashion. Internet Explorer® 7, Safari® 2, Firefox® 2, Google® Chrome™ 7 or higher. That is correct. The router comes with two USB 2.0 ports.